Paloma Faith really is something else. An up and coming actress and fashion icon, her music reflects every aspect her appealing individuality. It is bold, fresh and ever so slightly eccentric. Clearly a winning formula as her debut album, “Do You Want The Truth Or Something Beautiful” recently went Gold. Her new single “Upside Down”, is taken from this album and stands as a fine ambassador for her impressive catalogue of work. The track opens to the provocative sounds of a 1940s-style instrumental, an instant reminder of Faith’s eccentricity and originality. 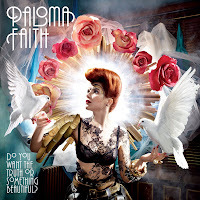 This intriguing sound gels surprisingly well with the snappy jazz beat that kicks in shortly after, not to mention Faith’s confident soulful vocals, which echo a combination Amy Winehouse and Duffy, though Paloma Faith is arguably better than both of them put together. Her lyrics are simple yet intriguing and are totally appropriate given the whimsical persona of their creator. Faith sings of the joys of being eccentric (“Ain’t got no pain/Ain’t got no rules/I think I like/Living upside down”) and of the difficulty of existing this way in a world that favours convention and conformity, before urging us to bring a little quirkiness into our own lives. (“Sometimes life can taste so sweet/When you slow it down/You start to see the world a little differently/When you turn it upside down”). She’s not wrong. In short, “Upside Down” is a great single; catchy, original and surreal. In fact it’s difficult to find any fault with it whatsoever, nor with Faith herself who seems destined to become an artist of enormous influence and acclaim.